One man has been cooking and slicing meat at Jake’s Deli for nine years; the cook before him, for 17 years. The friendly woman whose daughter also works at Jake’s has been cooking soup and serving customers food for seven years. She’s the kind who never forgets a face, and always remembers your order. Known for its loyal staff, delicious corned beef sandwiches and its once time-warped, brown-tarnished windows, Jake’s Deli has been a Lindsay Heights staple since 1955. After 57 years at the corner of 17th Street and North Avenue, Jake’s Deli opened a second location at the Shops of Grand Avenue on Dec. 1. Anthony Lewis, 44, who has been coming to Jake’s since he was a kid, was happy to hear about the second location. Lewis, a new homeowner in Lindsay Heights, said he continues to go to Jake’s for the corned beef and pastrami sandwiches and the soup. The new deli is located on the west side of the mall on the second level. The cozy space, just a few steps away from Boston Store, is 160 square feet. After Gary Plassmeyer became one of the deli’s three owners (the other two are “Bud” Selig, Major League Baseball commissioner, and Andrew Baer, owner of a Wausau beverage wholesaler) in 2009, he started to ask around to see if people outside of Lindsay Heights knew of Jake’s; many had not, according to Dickson. “For the people who have never been here, or who work downtown and can’t get here, the idea was if you can’t come to Jake’s, we’ll bring Jake’s to you,” Dickson said. The reputation of the original location, at 1634 W North Ave., may be another reason for a second deli. 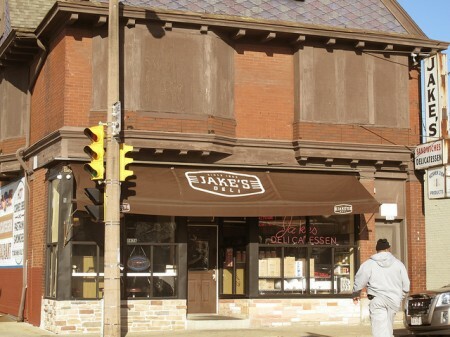 “The goal for the new location is to re-introduce much of downtown to Jake’s: those who have either forgotten about it or refuse to venture to North Avenue,” said Plassmeyer. Jake’s began vending at farmers markets and other events in the summer, including at Bastille Days and the Wisconsin State Fair. 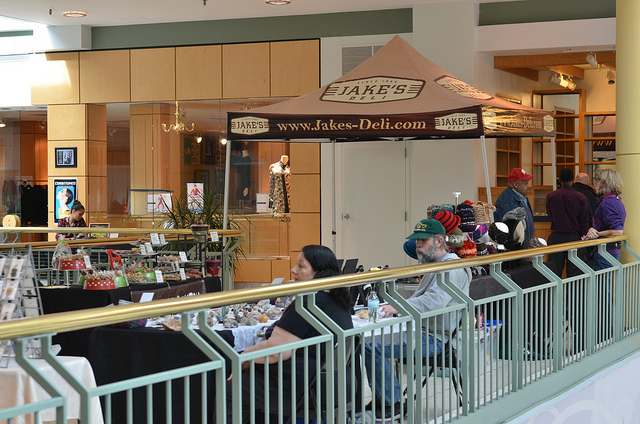 The deli joined J-Shore’s year-round farmers market at Bayshore Town Center in mid-November, selling meat by the pound, loaves of bread, soup and gift certificates on Fridays from 1 p.m. to 5 p.m.
Because of the restaurant’s participation at Westown’s Winter Market in Shops of Grand Avenue, the owners were “approached to be a permanent tenant,” according to Plassmeyer. Jake’s now has a one-year lease. Although Plassmeyer acknowledged business at 17th Street might decrease slightly because of the second deli, “North Avenue will never close,” he said. He plans to use the original location to cook the food for the satellite sites, in addition to running it as a retail deli. “We recently upgraded the kitchen to be able to open a couple smaller locations around the city. 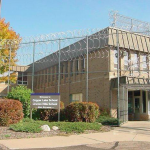 (We’re) looking to possibly do one more small spot,” Plassmeyer added. 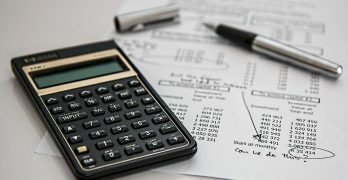 According to Dickson, by this summer, the owners plan to start bike delivery lunch service to downtown offices. Though Jake’s will serve the same food at other locations, the unique history and culture of 1634 W. North Ave. cannot be duplicated. “There’s culture on both sides of the counter,” said Dickson. “People remember who you are, what you ordered, and names of your kids,” he added.